The garden has shifted a gear again, we are now entering a more vibrant show. Out go the pretty soft pinks and purples and in come the ‘blousy’ reds, golden yellows and vibrant oranges. The garden takes on a different appearance now, more solid and enveloping. Hemerocallis Scarlet Oak a most stunning daylily. 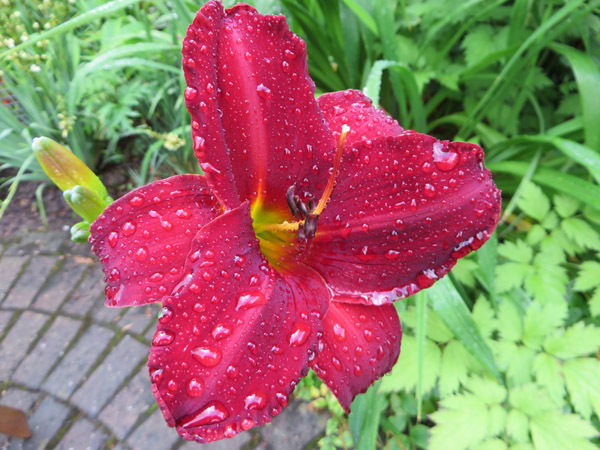 With such a deep colour and strong growth this has to be a favourite with me, it must really like it’s position as it always performs well. Helenium Moerheim Beauty, I love the dark centres on these. Looking great at the front of the border. The beginnings of Cautleya Crug Canary, with the remains of Lysimachia punctata variegata.This has never made much of a plant not like the plain leaved Lysimachia I’m glad to say. 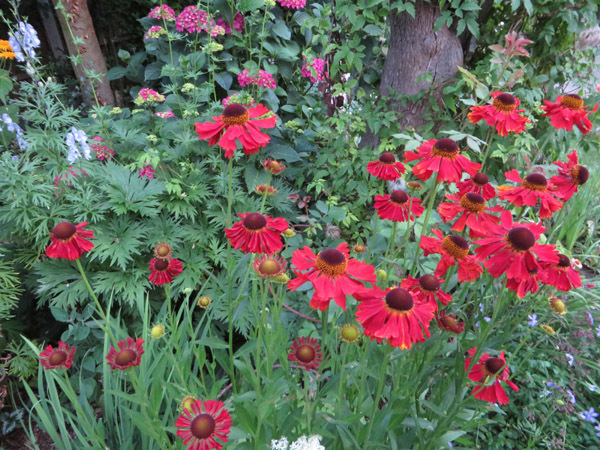 Helenium Waltraut just starting to bulk up this year. At the very back you might just see Nasturtium Alaska. Yes I know, you get loads of black fly but I’m willing to put up with that at the back of a border. 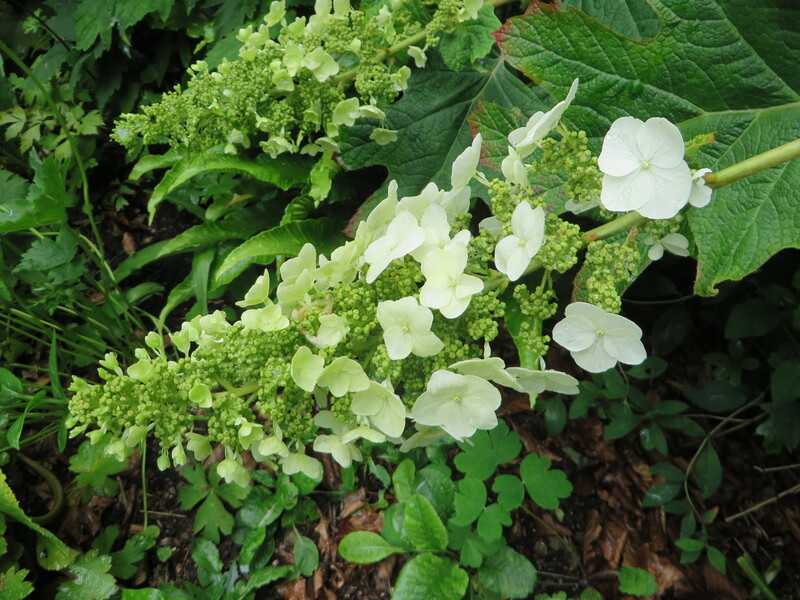 Plus the leaves are variegated with creamy white. Erysimum Orange Bedder, this has already had two haircuts and still flowers, a wonderful plant that sold very well at the Open Garden this year. 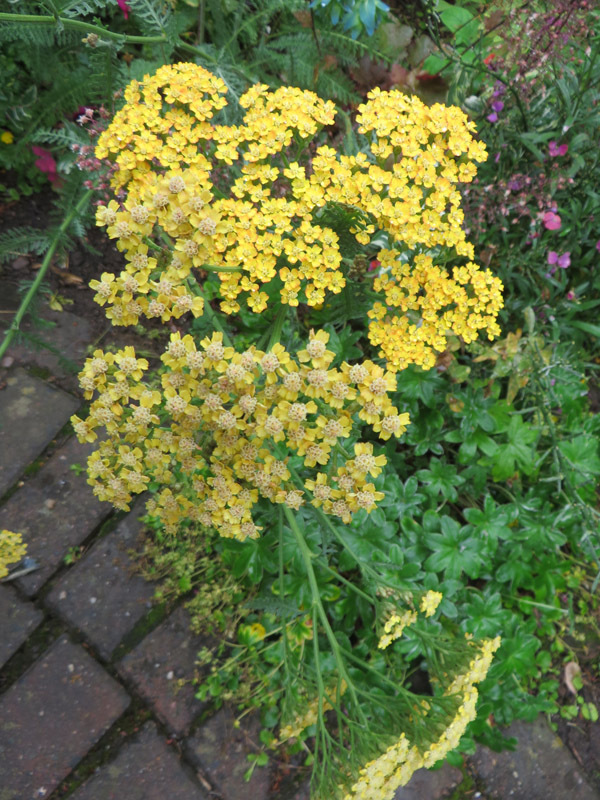 I have several around the garden, they add a touch of spice…. 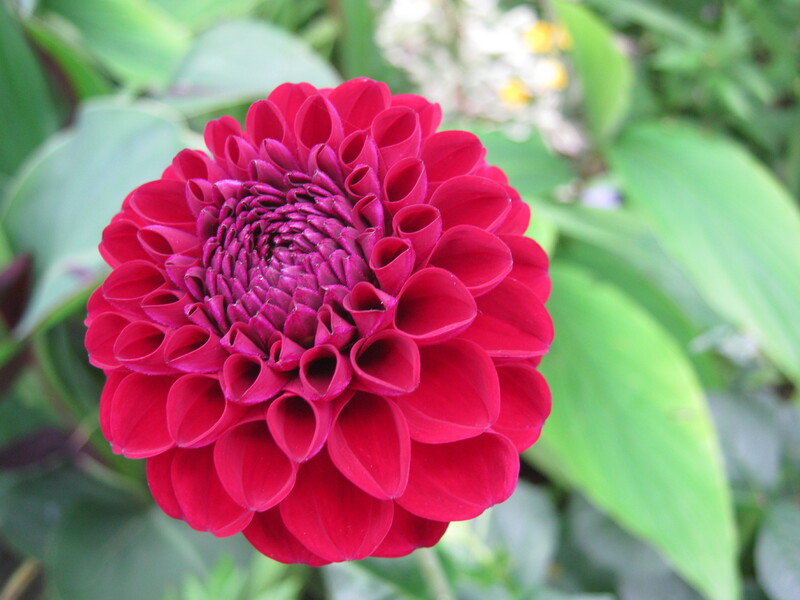 Zinnia…. 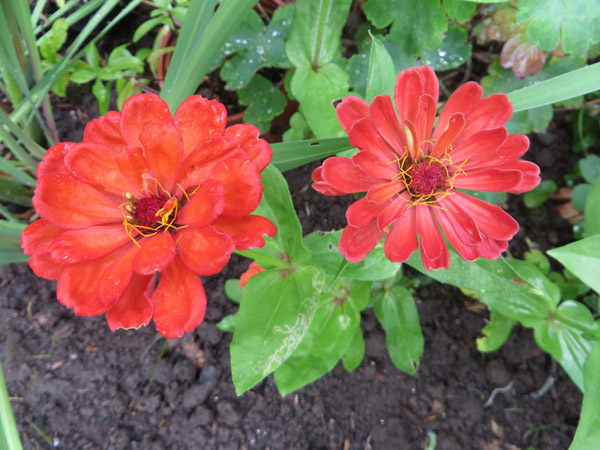 I have posted before about Zinnia and I absolutely love them, just cannot grow them well. I think the solution to this one is the allotment. They would have more space and Mr Malc could bring bunches home. Nice. The Dahlia in this area are just starting to make an appearance, I’m waiting for a vibrant orange with dark leaves to open, I’m sure that will look stunning. Now this is an experiment. Recently on the TV, on a gardening programme, someone was demonstrating how to make Japanese hanging planters. They are called Cocadarma, now I may have spelt that wrong. Well I managed to make three and they have all grown well. The ones on the telly were covered in moss but being as the programme wasn’t aired until only a few weeks ago, moss wasn’t available so I found a good substitute. ‘Mind your own business’ or ‘Baby’s Tears’ you get my drift, the stuff you can never get rid of. Well it’s covered them well, planted with a nasturtium, an Ipomea,and a hanging basket plant with small blue star flowers who’s name escapes me. I just have to remember to water them though and that is done by plunging them in a bucket of water overnight every few days. 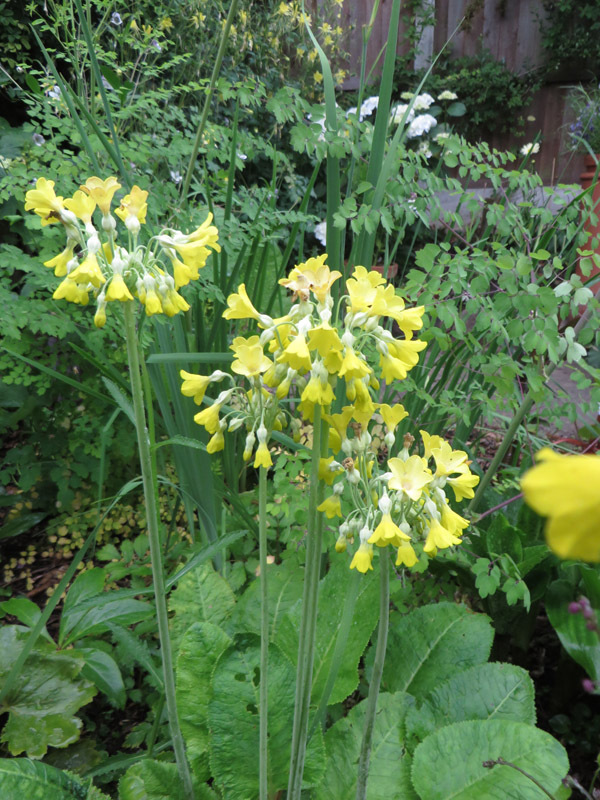 They are a taking point and if they decide to flower well I may try again next year…. 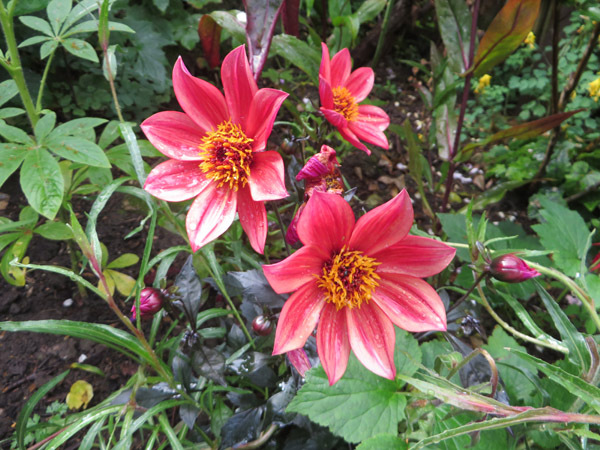 What ever the week holds weather wise enjoy your garden….I have lots of rethinking to do in mine, lots of lists to make….till next time. I don’t know about you but my garden seems to have flushes of one colour. We have had a blue/ purple theme, then the roses came out and it was decidedly pink not my favourite colour at the best of times. This is now my most enjoyable period in the garden, this is when most of my ‘specials’ start to do their thing. 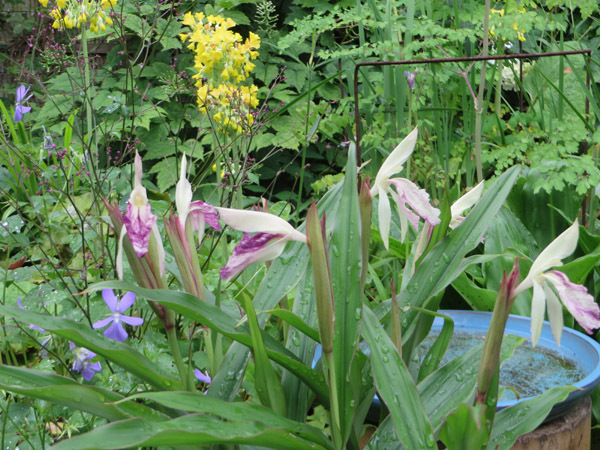 Eucomis are budding up, the dierama are sending forth their beautiful, if fleeting, wands and the Roscoea have opened their first flowers. I love the exuberance of the garden at this time of year but sometimes you get overpowered by all around you. So it’s good to have a special corner where all these smaller more delicate looking and less showy plants can be seen more clearly. This has always been known as my White Garden, but over the years soft yellows and purples and blue have crept in, along with hips and berries in shades of red and orange in the autumn/winter. I have a plaque above one of the gates to this area and it says ‘secret garden’, the girls call it this but I still think of it as my white garden …. old habits etc …. Along the boundaries are the Hydrangea paniculata, Roses Navada, Iceburg, Ginger Syllabub and Veilchenblau. 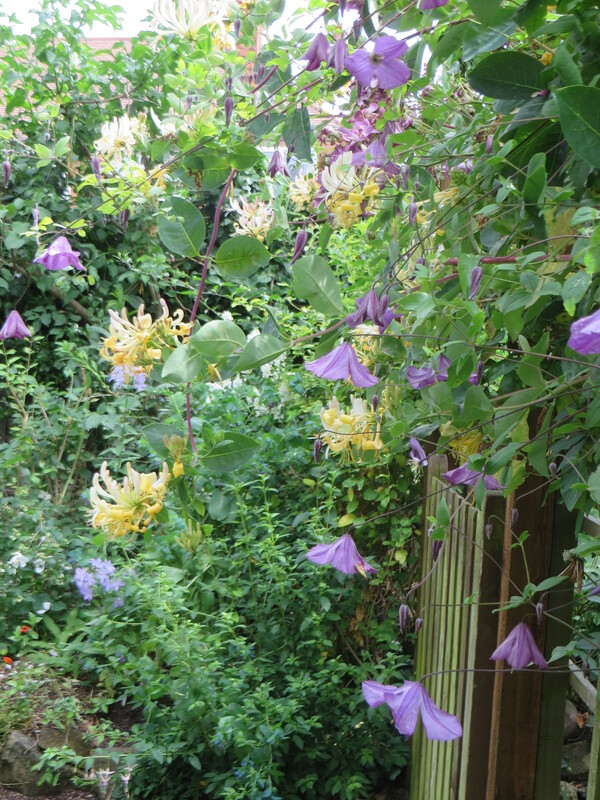 These are filled out with various lost label clematis. This makes this tiny space quite secluded and private. I can sit in here with a cuppa and feel quite relaxed. It’s especially nice when the sun is setting and the birds are singing their bedtime songs. Here are a few plants that are flowering at this time. 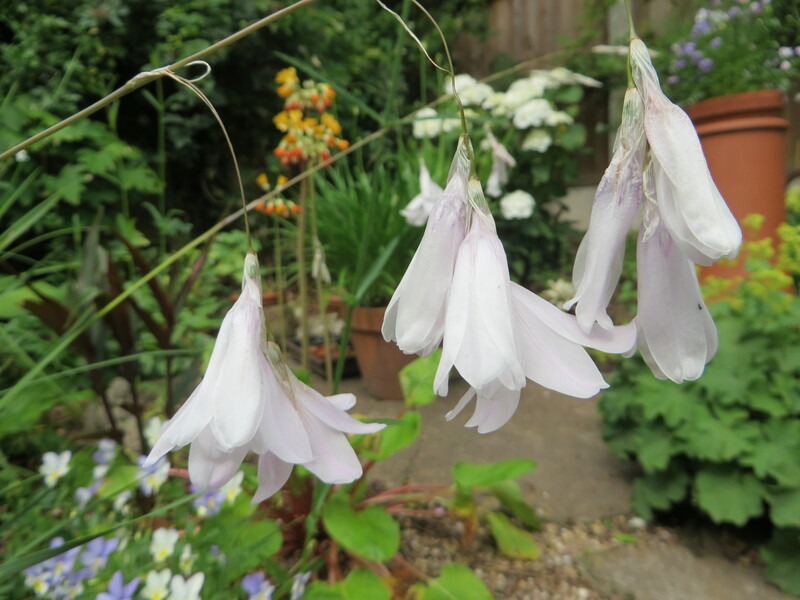 Dierama ‘Guinevere’ a beautiful pure white flower reaching just a metre tall. This is one of several different Dierama I have, most grown from seed. I might need a bit of help with the ident’ for this. 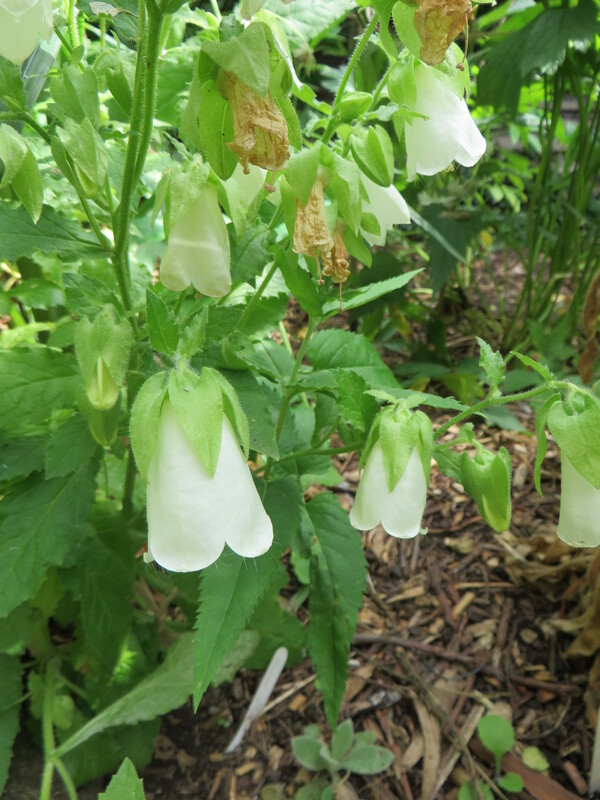 A campanula I presume but again no label but I like it’s lush leaves and really large pendulous flowers. 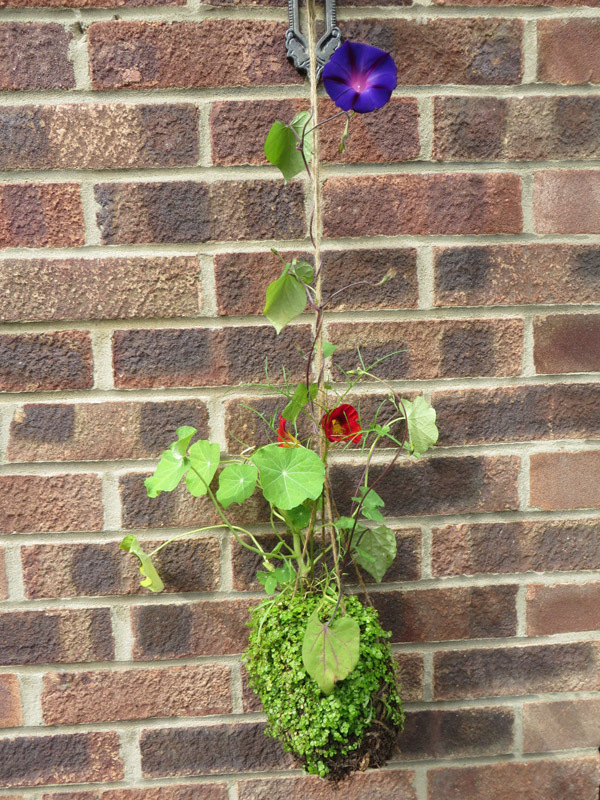 After R’ Veilchenblau has finished the honey suckle and a seedling clematis take over. 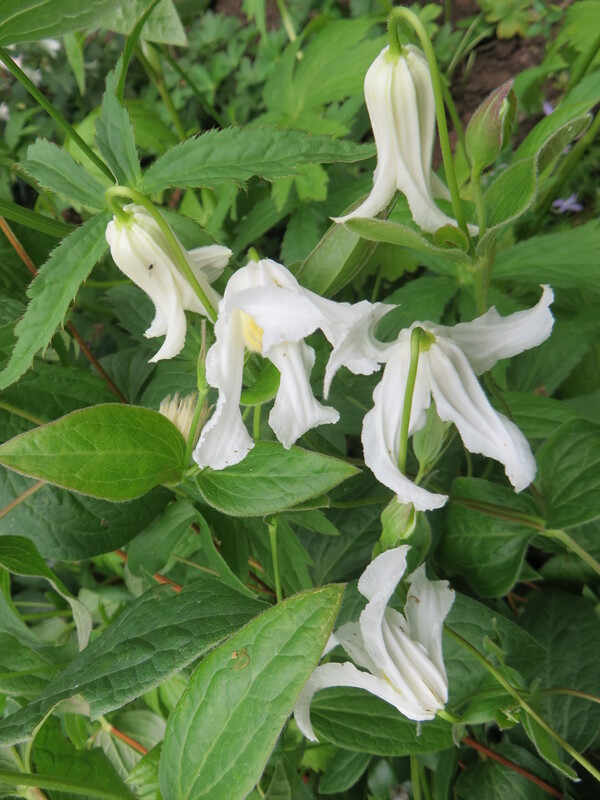 Clematis Integrefolia Alba looks stunning growing through low perennials. Romnya coulteri. Not growing in this area at the moment but at the end of the year this will be moved to a new spot. This plant was only bought from Elizabeth Macgregor two years ago and has already reached two metres plus. So I have cleared a large space for it the White Garden. 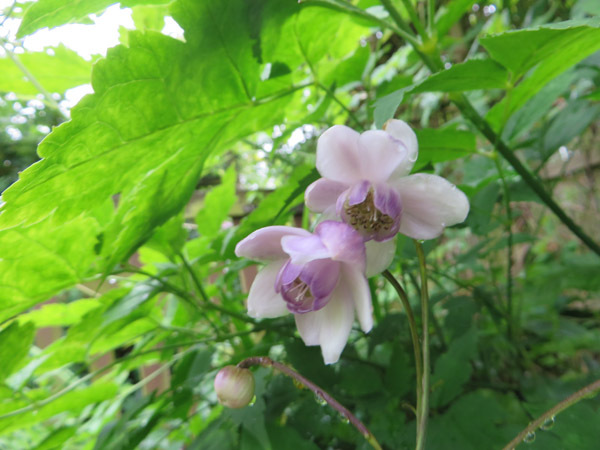 Anemonopsis macrophylla a very beautiful choice plant loves the cool shade of the W/G. Only growing to 60 cms. 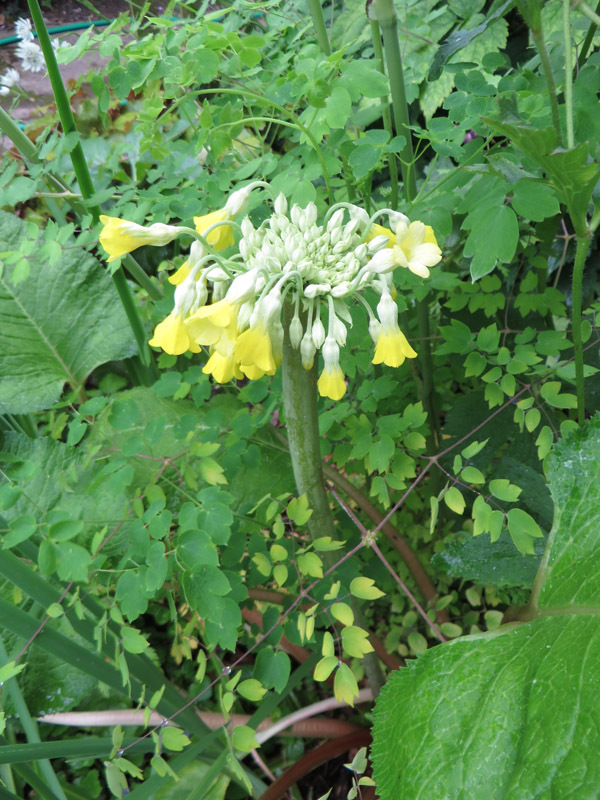 Lots of Primula florindae have seeded around the damp area and the perfume is wonderful. 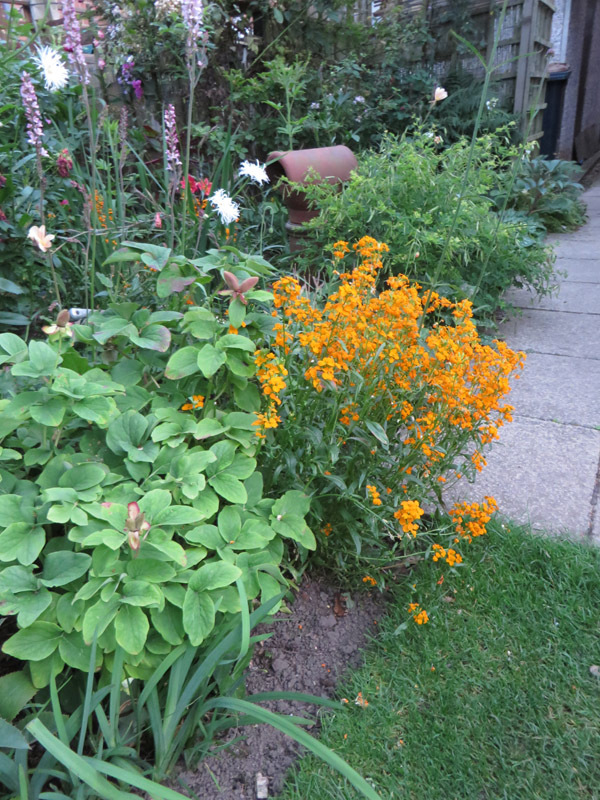 Some have now seeded a soft orange but I will leave them here as they compliment the yellow. This florindae is fasciated, the stem is almost two cms across and has many many more buds than normal. I can’t wait for it to open a bit more. Roscoea beesiana, the first of many in my collection of Roscoea. Looking just like orchids, they are quite tough plants bulking up year on year. I’ve cleared quite a large part of this garden of overgrown shrubs to make way for more special plants. This will soon be achieved when we go to North Wales this year as we will be visiting my favourite nursery Crug Farm Plants. I’ve mentioned them before and several of you out there already pay them a visit too. I have to make long lists off their web site as I never know what will be available by the time I get there. That’s my excuse what’s yours…. 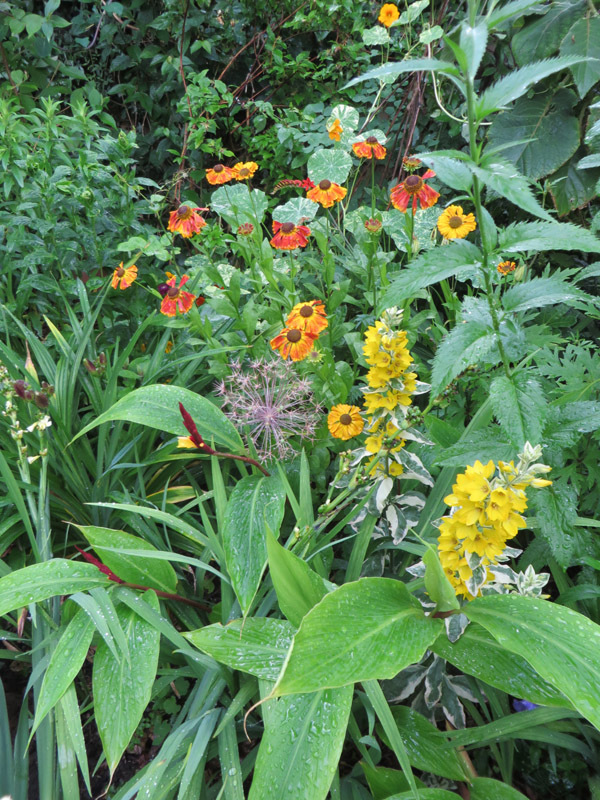 Enjoy your garden come rain or shine, we are off to a family gathering, should be fun…..
Is Beauty Only Skin Deep ? This year due to some quirk of nature, I have all of my Peonys in flower. This has never happened before. 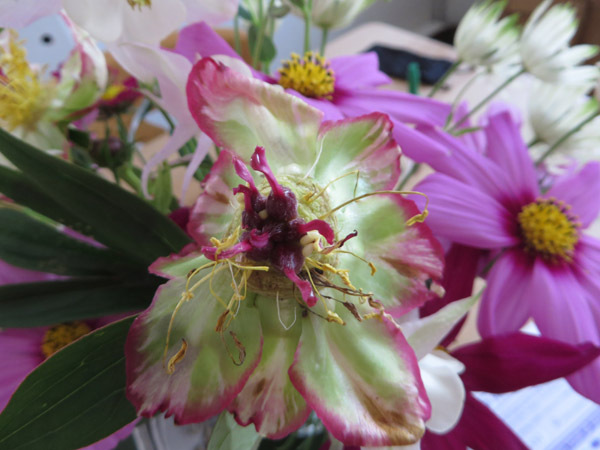 So we were obviously going to get some extreme weather conditions as these gorgeous blooms don’t take much to make them look like tattered tired bridesmaids after a wedding reception. Sure enough we have had sudden sharp down pours and some extremely gusty winds. 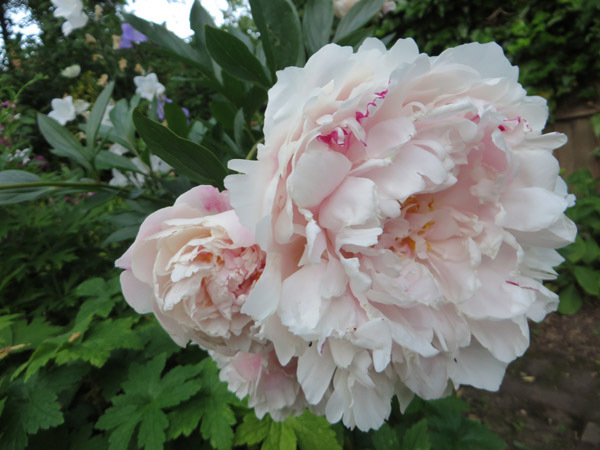 I was given a piece of this peony about 20 years ago by an old school friend, she told me it was Sarah Bernhardt. It does well here but I am not sure of the true identity but Sarah she will stay until I am told otherwise. Now the reason for putting this on a post is because of the two following pictures. I found these after the strong winds the other day. 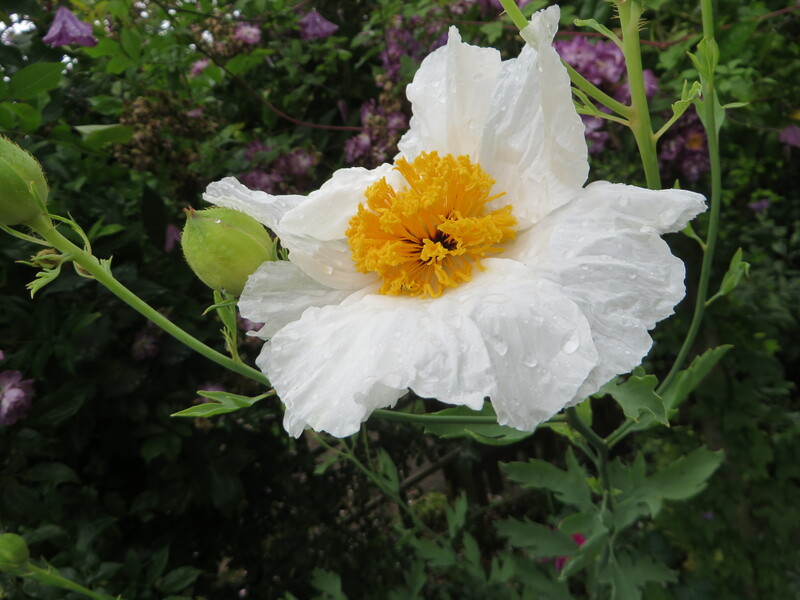 They are the calyx on the peony, and how beautiful are they ? 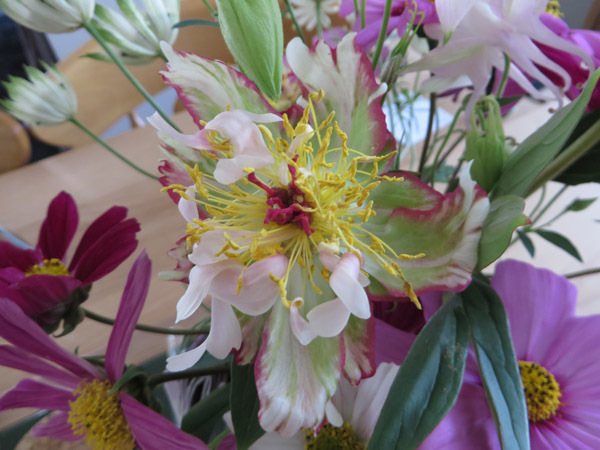 Now I have other peony in the garden but none of them have the same calyx. I wonder how long these will last in water ?